The number of people in the U.S. diagnosed with the plague each year: 7. The number of people who’ve had the bubonic plague in New York City in more than 100 years: 2. And that unfortunate pair was John Hugh Tull, Jr., 53, and his wife Lucinda Marker, 47. According to the Centers for Disease Control and Prevention, the yersinia pestis bacteria is most commonly spread by infected fleas. People can also become infected by having direct contact with infected tissues or fluids, by handling an infected animal or from inhaling respiratory droplets from infected people or cats. There are three forms of the plague: bubonic, septicemic and pneumonic. Bubonic causes fever, headache, chills, weakness and swollen/tender lymph nodes. If an infected person is not treated quickly, the bacteria multiply in the lymph nodes and spread throughout the body, causing an often fatal condition called septicemic plague. Untreated plague can also spread to the lungs; when it does, the victims get pneumonic plague. In the 14th century, the plague killed approximately 25 million people throughout Europe. Tull and Marker were walking their dogs near their home in Eldorado, N.M., when they were bitten by fleas infected with bubonic plague. Then on Nov. 1, the couple visited New York City, where they had planned to watch the marathon, tour the Metropolitan Museum and visit with friends. Within 48 hours of their arrival, however, those plans were scuttled by illness. At first, Tull and Marker thought it was something simple, like too much food and liquor, or maybe a bug. They certainly seemed to have flu-like symptoms, including fevers, headaches, exhaustion and swollen glands. But when Tull’s condition worsened, they called Ronald Primas, a travel doctor who was familiar with esoteric diseases. His first thought: Bubonic plague. At Beth Israel Medical Center North, doctors confirmed Primas’ diagnosis, and the couple became known as New York City’s first plague case in more than a century. Although Marker responded well to the large doses of antibiotics doctors gave her, Tull did not. He developed septicemic plague and was given a 1 percent chance of survival. Tull was put on dialysis, hooked up to a respirator and spent the next 90 days in a medically-induced a coma. When gangrene set in, doctors were forced to amputate both of his legs below the knee. Throughout the horrific ordeal, Marker remained by Tull’s side. Dealing with the plague wasn’t the couple’s only difficult experience in New York. Because they became ill so quickly after arriving in the city — and just 14 months after the September 11th terrorist attacks — Marker and the hospital staff were interviewed by officials from the CDC, the FBI, New Mexico and New York health officials as well as dozens of media outlets. With the city in a panic, authorities investigated the couple’s backgrounds and searched their N.M. home before determining they were neither the victims nor perpetrators of bio-terrorism. Despite the invasion of their privacy, the couple’s view of the city never soured. During the nine months Tull spent at Beth Israel, setbacks were faced with grim determination and small improvements were celebrated, both in person and online. At one point, the hospital staff even took to wearing “Free John Tull” buttons to encourage his progress. The couple returned to New Mexico on Feb. 10, 2003, but Tull was still too sick to go home. Yet upon his arrival at Kindred Hospital Albuquerque, he was met by dozens of loved ones carrying signs and singing corny songs. After learning that Tull’s medical bills would eventually exceed $2 million, their friends launched the John Tull Recovery Fund. Tull graduated from the University of Texas and South Texas College of Law. Prior to his illness, he worked as an attorney in both Texas and New Mexico, and served as the head of New Mexico’s state insurance fraud bureau. He was also general council for the New Mexico Economic Development Department. The Amarillo native enjoyed reading, telling jokes and stories and volunteering with the Atalya Search and Rescue. Although the couple, who wed in 1998, did not have children together, Tull had three from previous marriages, and seven grandchildren. Ten years after contracting the plague, Tull was retired and receiving disability pension. 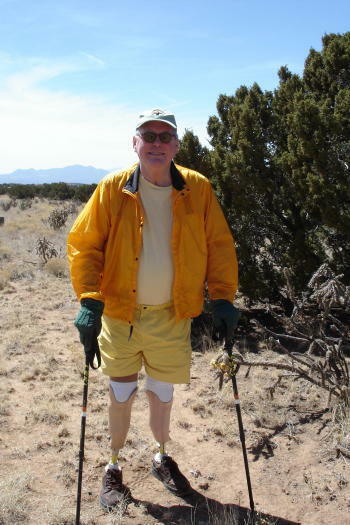 With the help of prosthetic legs, the tough and athletic Texan was able to hike, bike, drive and attend an annual fishing trip with friends. Last month, Tull was diagnosed with cancer of the gastrointestinal tract, a disease that doctors believe was unconnected to his bout with the plague. He died on June 25. He was 65. At the time of Tull’s death, the couple was writing a memoir, “The Plague: One Couple’s Journey To Hell and Back.” Marker intends to finish it.